Each section contains focused articles on topics that test the expertise and knowledge of the reader. This series represents an important new departure in providing high quality educational material to qualified cardiologists as well as those in training. The collection in three self contained volumes covers a comprehensive range of clinically relevant areas. 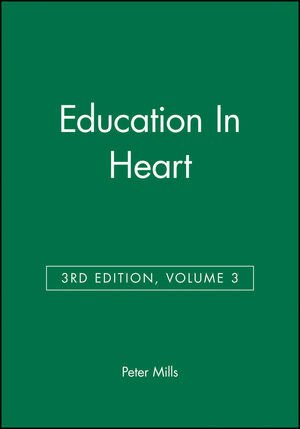 Peter Mills is the editor of Education In Heart, 3rd Edition, Volume 3, published by Wiley. Carotid artery surgery for people with existing coronary artery disease. The "no-reflow" phenomenon: basic science and clinical correlates. Screening relatives of patients with premature coronary heart disease. Acute myocardial infarction: reperfusion and treatment. Off-pump coronary artery bypass surgery. Management of cardiogenic shock complicating acute myocardial infarction. The need for palliative care in the management of heart failure. Exercise testing in the assessment of chronic congestive heart failure. Timing of mitral valve surgery. The medical management of valvar heart disease. Choice of heart valve prosthesis. Which patient should be referred to an electrophysiologist: supraventricular tachycardia. Arrhythmias in adults with congenital heart disease. Novel mapping techniques for cardiac electrophysiology. Patients with ventricular arrhythmias: who should be referred to an electrophysiologist?. Heart failure in the young. Sudden death in children and adolescents. Pulmonary hypertension in the young. Understanding coronary artery disease: tomographic imaging with intravascular ultrasound. Role of echocardiography in acute coronary syndromes. Doppler echocardiographic assessment of valvar regurgitation. Cardiovascular and coronary risk estimation in hypertension management. Anaesthesia and the cardiac patient: the patient versus the procedure. Myocardial molecular biology: an introduction. Heart disease, guidelines, regulations, and the law. Apoptosis in the cardiovascular system. To whom do the research findings apply?. Development and structure of the atrial septum. Effect of partial compliance on cardiovascular medication effectiveness.